Henry Ward Ranger (1858-1916), The Wood Cutters, c.1884, oil on canvas, 28 1/8 x 36 1/8 inches, Brigham Young University Museum of Art. Like the 19th-century French Barbizon painters he admired, Henry Ward Ranger focused on landscapes and tried to establish the mood of his paintings through the use of limited color tones. 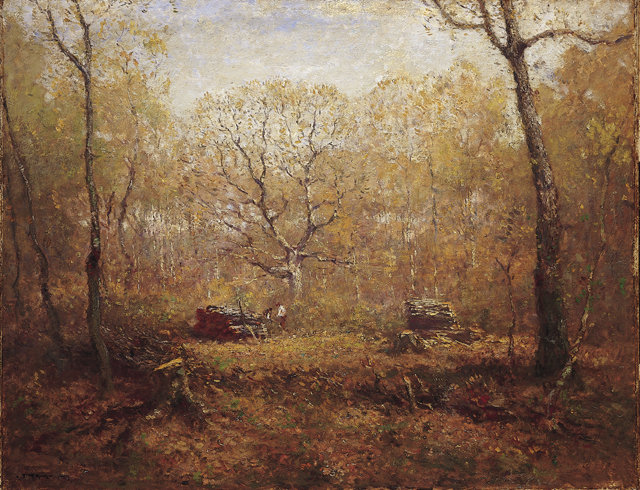 In this painting, the brown and orange hues evoke a feeling of autumn. The tiny red and white patches of paint in the center of the canvas draw our attention to the figures of the woodcutters in a forest clearing. The fallen leaves and felled trees suggest that the men are preparing wood for the cold winter months ahead.